Akit's Complaint Department is proud to be your unofficial source of information about the TransLink/Clipper program: providing insight, advice, tips, and the latest news that you would not likely hear from other news sources. If the folks at TL/Clipper refers their Facebook fans to an article on my blog, they know I'm some kind of legend. Well... on to the updates. With only a week and a half until the official change from TransLink to Clipper is completed (June 16), here's some updates on what's going on. 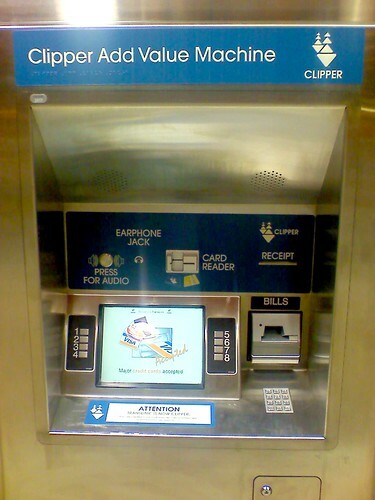 I made an error to the planned transition of the automated add value machines for conversion from the chipped (TransLink) to non-chipped (Clipper) cards. The re-branded automated add value machines still have their card slot, however, modified to be able to read and write to the card without the need of the gold chip. 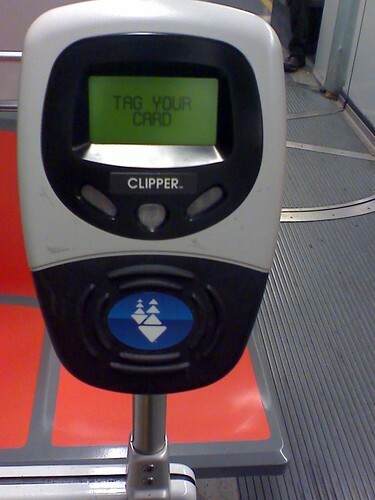 It's a cost savings for TL/Clipper and the MTC because it would cost extra to install a sensor pad reader similar to what BART's automated ticketing machines have. While BART's ticketing machine sensors are not active, they intend to be in the future to allow the adding of funds and other types of purchases. There's a lot more people using the cards on the Muni system. When I was riding the bus yesterday (Saturday), the beeping sounds happened more often, but the traditional fare media (passes, transfers, and cash fares) are still the majority. If you pay for your rides in e-cash and transfer to another vehicle, the card reader screen now tells you how much time is remaining until the transfer expires. One item that needs improvement is the little screen on the BART fare gates. The balance paid and remaining balance should be in a larger size. The "OK" letters take-over too much of the screen. The re-branded vehicle card readers have been done with industrial strength stickers covering the card target spot and the word "TransLink." Let's see how long those stickers will last until someone tries to pry it off. As I previously mentioned, the automated add value machines' hardware has not changed; but do expect the software to be updated soon because it still says "TransLink." Photos of the card reader and automated add value machine taken on June 5, 2010 and was done by myself. View all the TL/Clipper photos I have taken by clicking here.